The good ole Australian Labor party romped home as was expected some here would have called it a Rout including me. 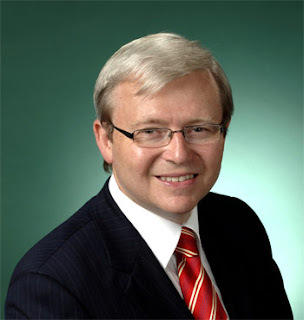 The monies some of the retiring ministers will receive including use of free air travel to me are horrendous when lots of us are on the breadline; incoming Prime Minister Kevin Rudd is leaving things as they stand he was quoted as saying today. 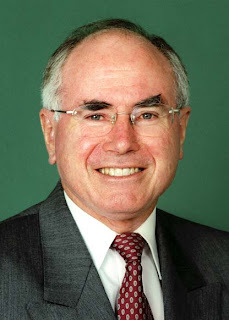 The Member for Bennelong ex Prime Minister John Howard has lost his seat to ex ABC (Australia) news reader and reporter Maxine McKew, the smirking ex treasurer Peter Costello was re-elected into the parliament but decided to stand down for election as head of the Liberal party. The new Prime Minister elect is rumoured to be sworn in with his new ministry on Monday in the capital Canberra, this depends of course on the Labor parties choice at their Caucus meeting and a woman as Deputy Prime Minister that sounds good, not before time lots of us would say me included. Kev promised us faster broadband I can’t wait for that to happen, on the other hand John Howard point blank refused to make it faster; a deal with semi government Telco Telstra is my guess. On a not so nice note it seems that former Guantanamo Bay prisoner an Australian citizen Mamdouh Habib has filed a defamation suit against a columnist of Nationwide News saying he had made false claims this occurred in front of American and Australian officials. I recall the case very well as do lots of Australians. No smoke without fire is my contention here, guess he may collect some cash; small recompense for his suffering or his family is my view. At long last Australia throws off the conservative yoke ************************************************************************************** I have of course been watching (well I still am) the election on of whether or not our incumbent Prime Minister will lose the election well I do believe he has in more ways than one. He may well lose his seat as the Member of Parliament for Bennelong in fact it seems likely he will. Not a word has he said so far nary a word. In news just in he has conceded defeat. So Mr.Rudd will be sworn in as the new PM and his deputy PM who is a woman Julia Guillard which will make a pleasant change Well there was a murmur he wanted to wait until all postal votes come in; these come from all over the world wherever Australians are on holiday and such. To me it matters not he has lost the reins of power sadly his offsider retained his seat but in opposition only. One thing that does bother me with the change, our relationship will change with the USA but not for long if their democrats get complete power so for my American friends roll on 2008. These results can be seen on this site but; for how long is not known it may be a temporary site for this event. So to sum up goodbye John and welcome Kev who incidentally went to school in my home town well done Kev. I see that the commonwealth action group in the Commonwealth of Nations (TCAG), formerly known as the British Commonwealth and at one time the British Empire; is having a shot at the dictator Pervez Musharraf in Pakistan. Good on them I reckon there is something wrong with the man. Pakistan was indeed suspended from this organisation for 5 years at one time after a coup in the country but was reinstated after he appeared in Mufti instead of his uniform. These tin pot generals are all the flaming same look at all the troubles committed in a lot of countries by these self styled Autocrats at one time they were referred to as banana republics. Our foreign Minister Andrew Downer says he would support this action. This meeting of the CHOGM is being held in Uganda. I know I did a blog about me working away on my new website in my last post but I am getting there and now have many photo albums on it and quite a few videos as well. To make things harder one of my computers failed to start up and silly me could not find the windows disc to reboot it. After persevering into the wee hours I finally got it booted up so the language was bad here as you can imagine. I have a blog on it if you register you can comment I have only just started it so only 2 posts up to now; maybe 1 more tonight. I have even put a dictionary and thesaurus there to make it easier. My son who was responsible for getting hosting etc says I am doing just fine so that’s good. He reckons its ok and here’s me more concerned about my health. Still it keeps the mind alert thus staving off that demon Alzheimer’s so I have been told; it’s true though in my opinion. I also seem to be getting quite a few friends on Facebook as well; only one snag with Facebook it tends to get a tad demanding. For all that it’s still a very good social network. Here’s a site that could interest you if you are interested in the English language as spelt in other countries it explains in great detail how Aussies, Canadians British and Americans spell and pronounce their words. I get sick of my spell checker bringing up the Americanised version all the time even after I have disabled it in word and made Australian English my default. I did notice on this site that Canadians in the main use British words but American ones are used also. Personally I can find nothing wrong with the way Americans spell; I know what they mean I was just taught to spell differently that’s all. I have been a bit forgetful regarding blogging lately it seems there has been a lot happening for me with one thing and another health is one I do not intend blogging that one. But I have however finally got a website a personal one a big vote of thanks for it must go to my youngest son who was very enthusiastic about it even though very busy himself making websites and other things for other folk in the course of his business. He hosted it got me a domain name showed me how to create things on it, it was not an easy task for me getting on in years but I stuck with it. I seem to have been busy ever since what with editing it, creating a picture gallery there are videos on it in the form of a video diary. Another feature on it is Google maps another idea from my tormentor er son who arranged that bit showed me how to add maps (I found that bit a tad difficult) it is mainly about my location here on the Sunshine coast so very Australian I guess see here for more. With all this going on I kind of forgot my usual blog post on Armistice Day or as its known here Remembrance day I wore a poppy of course, I think in the USA it is called veterans day. I did do a little blog about it after all I seem to be losing it. I don’t need to rave on about it as most of us know what it means although there are times when I wonder if it was worth it the way things are shaping up in the world today sadly.